نصف‌النهار ۱۰۰ درجه غربی ۱۰۰مین نصف‌النهار غربی از گرینویچ است که از لحاظ زمانی 6ساعت و 40دقیقه با گرینویچ اختلاف زمانی دارد. 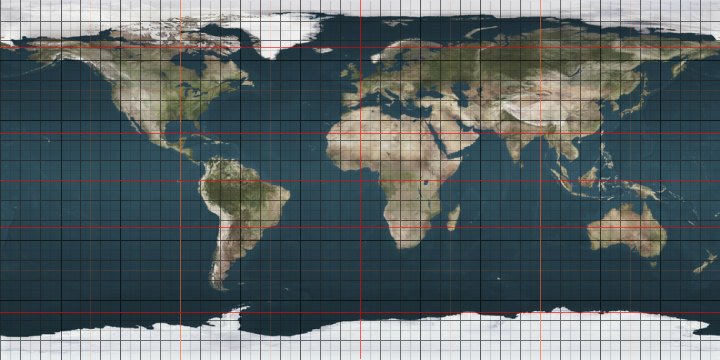 The meridian 100° west of Greenwich is a line of longitude that extends from the North Pole across the Arctic Ocean, North America, the Pacific Ocean, the Southern Ocean, and Antarctica to the South Pole. The 100th meridian west forms a great circle with the 80th meridian east. Part of the border between Texas and Oklahoma is defined by the 100th meridian west. In the United States the meridian 100° west of Greenwich forms the eastern border of the Texas panhandle with Oklahoma (which traces its origin to the Adams-Onís Treaty in 1819 which settled the border between New Spain and the United States between the Red River and Arkansas River). Dodge City, Kansas lies exactly at the intersection of the Arkansas River and the 100th meridian. In the central Great Plains, the meridian roughly marks the western boundary of the normal reach of moist air from the Gulf of Mexico, and the approximate boundary (although some areas do push the boundary slightly farther east) between the semi-arid climate to the west and the humid continental (north of about 37°N) and humid subtropical (south of about 37°N) climates to the east. The type of agriculture west of the meridian typically relies heavily on irrigation. Historically the meridian has often been taken as a rough boundary between the eastern and western United States. White settlement, spreading westward after the American Civil War, settled the area around this meridian during the 1870s. 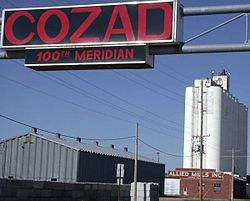 A sign across U.S. Highway 30 in Cozad, Nebraska, marks the place where the 100th meridian intersects with the routes of the Oregon Trail, Pony Express, transcontinental railroad, and the Lincoln Highway. Wallace Stegner's Beyond the Hundredth Meridian (1954), is a biography of John Wesley Powell, an explorer of the American West. The song "At the Hundredth Meridian" by The Tragically Hip is about the 100th meridian west, specifically in Canada, and how it has traditionally been considered "where the great plains begin."